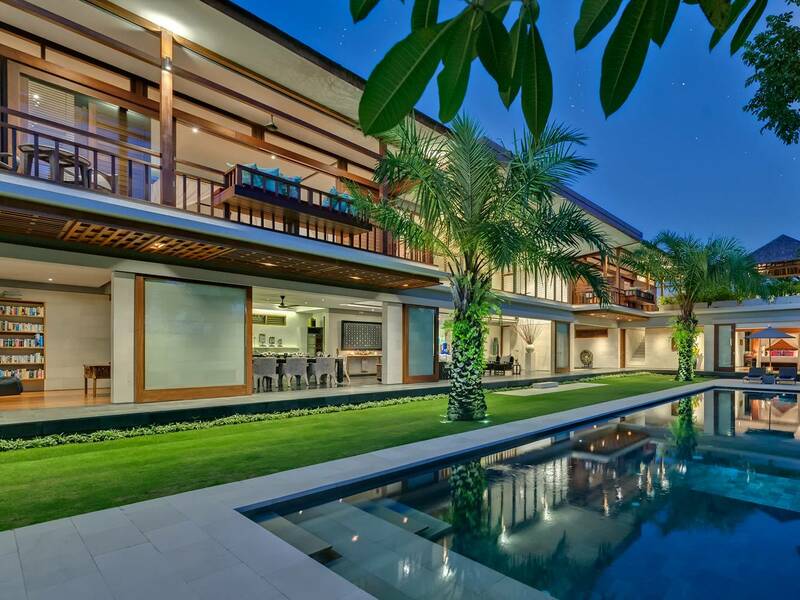 Luxury Canggu Villa with modern Balinese architecture, abundant space, a lush tropical garden and a quiet village location close to the beach in Canggu combine to create a stunning retreat for family and friends to enjoy the peace and tranquillity of Bali and for intimate and unforgettable weddings and special events. 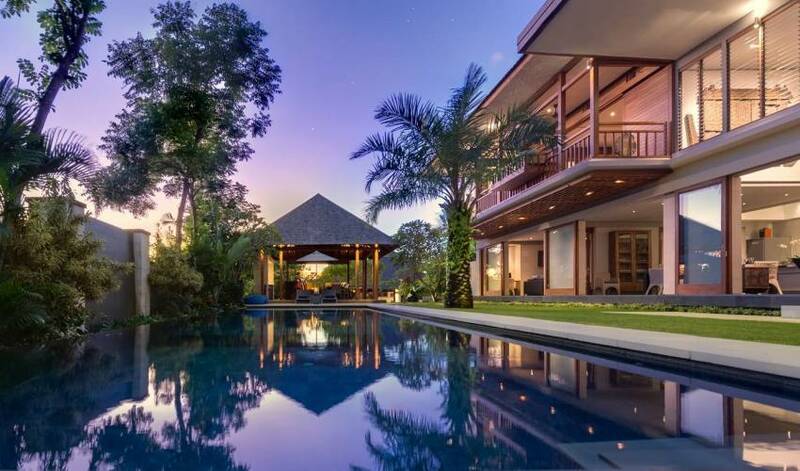 Five-bedroom Villa 1 and three-bedroom Villa 2 can each be rented separately, together, or with the one-bedroom pavilion that sits between the two in a walled garden and with a plunge pool of its own, to create a total of nine bedrooms. 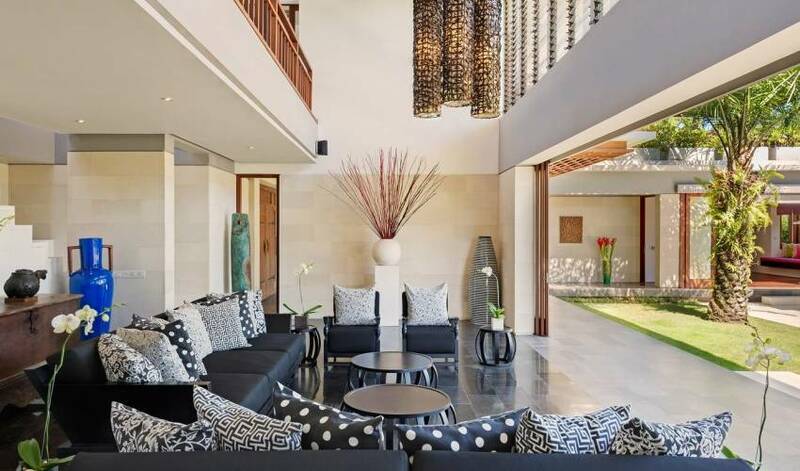 Modern Bali style, the greys of Echo Beach, the blues and whites of the sea and sky, five-star comforts and superb staff combine to create a luxury retreat in a small fishing village in Canggu. 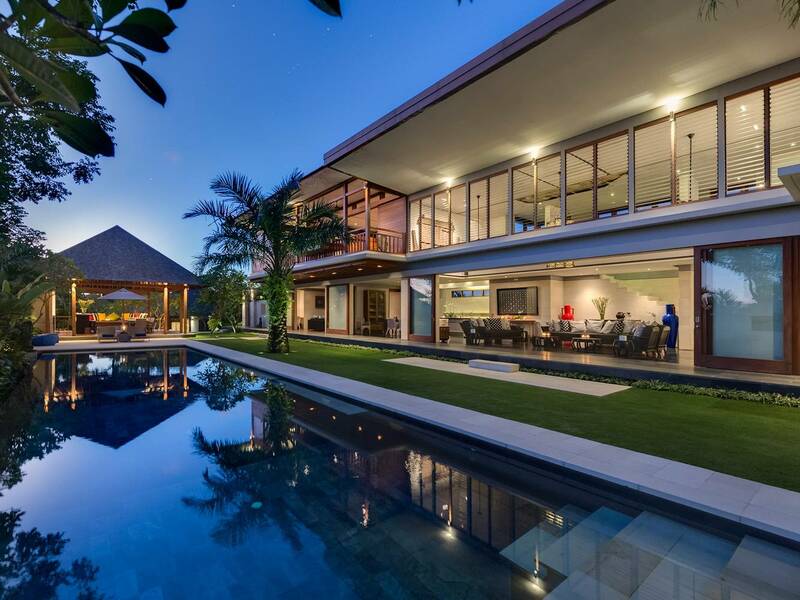 The villa’s name reflects the owners’ love for Bali, and their native New Zealand. 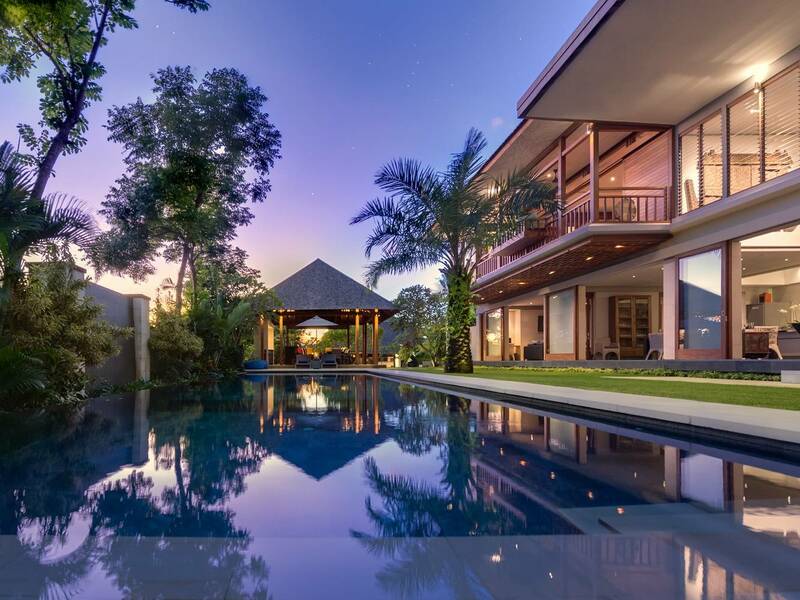 The villa greets you through antique Javanese doors before you walk across a traditional Balinese pond. 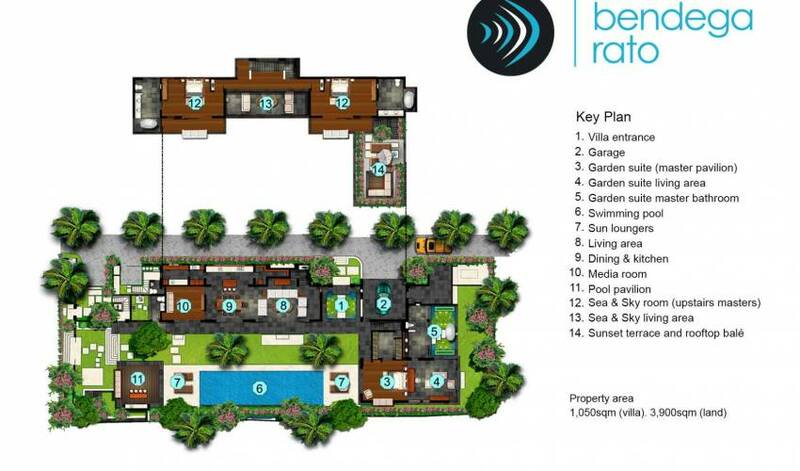 A vaulted open-plan living and dining area looks out onto the lush tropical garden and the 18 x 5-metre grey slate pool. A pool balé. with an antique bar and table seating ten, is the perfect place to unwind, while a media room, complete with state-of-the-art audio and video equipment, will keep you entertained. Upstairs, a sundeck and rooftop balé provide panoramic views of the legendary Bali sunsets. 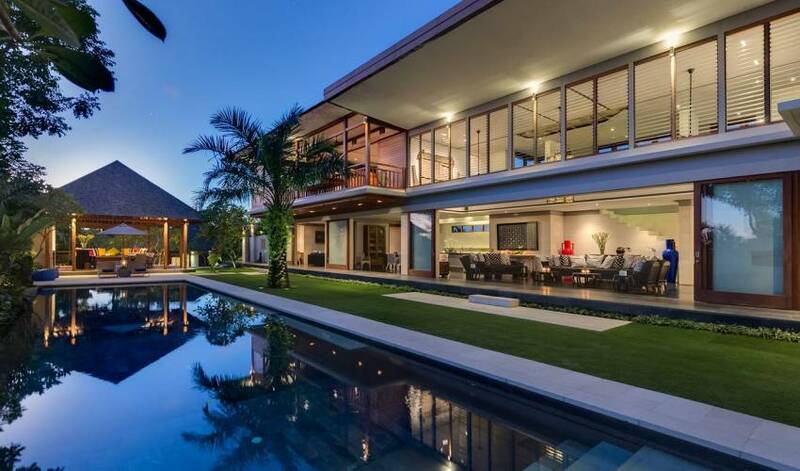 The villa has been carefully designed to maximise its 1,700-square metres of land amidst the rice terraces of Canggu. 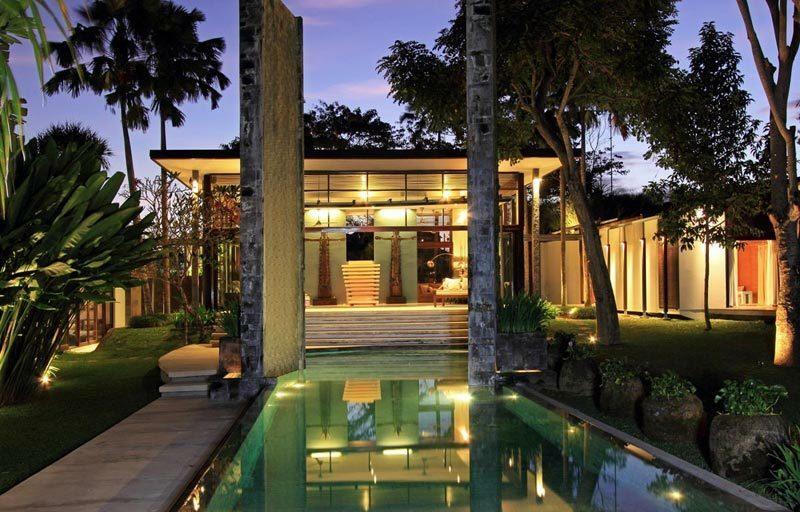 The villa is entered through two large Javanese antique teak doors. Guests step across a pond to the villa’s living and dining areas, with a view of the garden and swimming pool. The villa’s main pavilion forms a rough L-shape with the living and sleeping accommodation spread across the length of the two-storey building. 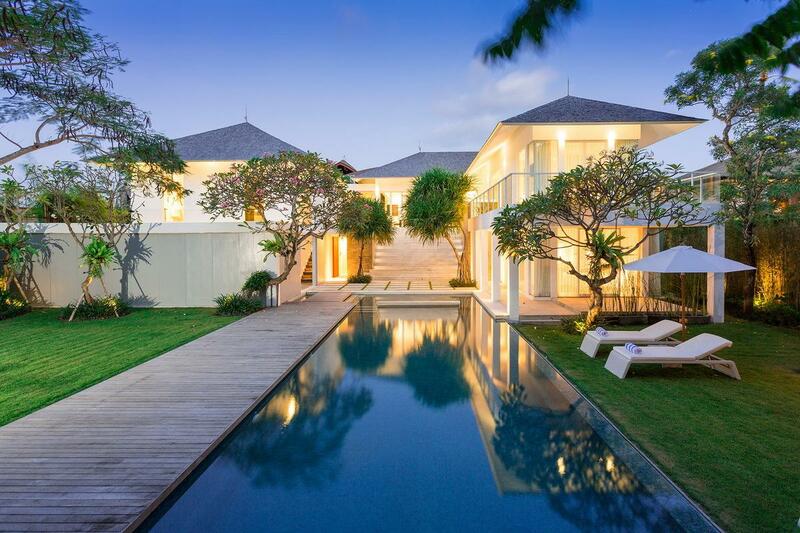 The 18 x 5-metre swimming pool runs parallel to the living and dining areas, with the master bedroom pavilion at one end and the pool pavilion at the other. The villa has a spacious, vaulted, open-plan living and dining area. 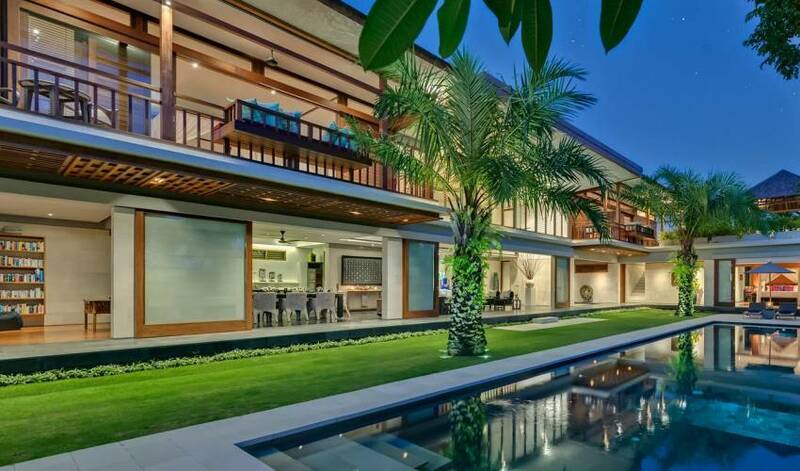 Three sets of glass doors open the room up to the outside with views of the garden and pool. The sitting room, which seats 12, is simply but very stylishly furnished with two oversized black teak sofas and armchairs set around coffee tables. Upholstery is brought to life with vibrant black and white patterned scatter cushions. In the dining area is a spectacular black teak table also seating 12. The room is furnished with some charming antiques pieces, including a rice chest, a large glass cabinet and, mounted on the double-height wall, an ornately carved antique ‘rice house’. Capture the magical Bali sunsets from the rooftop sundeck and enjoy a cocktail on the comfortable daybed in the balé. The sundeck can be accessed either through one of the bedrooms or by a separate staircase. The villa can accommodate six people in three king-bedded rooms in the main villa, and a separate master suite with its own plunge pool and balé is available to create a fourth double room on request. There is also capacity to add three foldaway beds for children if required. All bedrooms are generously sized, tastefully furnished, and have ensuite bathrooms and outdoor balconies or sitting areas. The Garden suite’s canopied, four-poster king-size bed looks out over the pool while, to the rear of the bedroom, looking out onto a private garden, is a living area equipped with a television, desk with computer and an antique daybed suitable for a small child to sleep on. The air-conditioned bathroom has a large walk-in rain shower and an outdoor stone bathtub. Like the Sea room, this room is reached by a private walkway, and also has a centrally placed, canopied, four-poster king-size bed. The bedroom looks out onto a private terrace with daybed and access to the rooftop sundeck and balé. The large ensuite bathroom includes an oversize tub and a walk-in rain shower. Set in a private courtyard, this master suite is accessed through wide, sliding doors in the garden wall between the suite and the main villa. It comes complete with its own 6 x 3-metre plunge pool, sun deck and pool balé. The outdoor bathroom has a decadent stone soaking tub for two and shower. Inside, the four-poster king-size bed sits beneath a traditional thatched roof. The room is equipped with an iPod dock, television, DVD player and minibar. 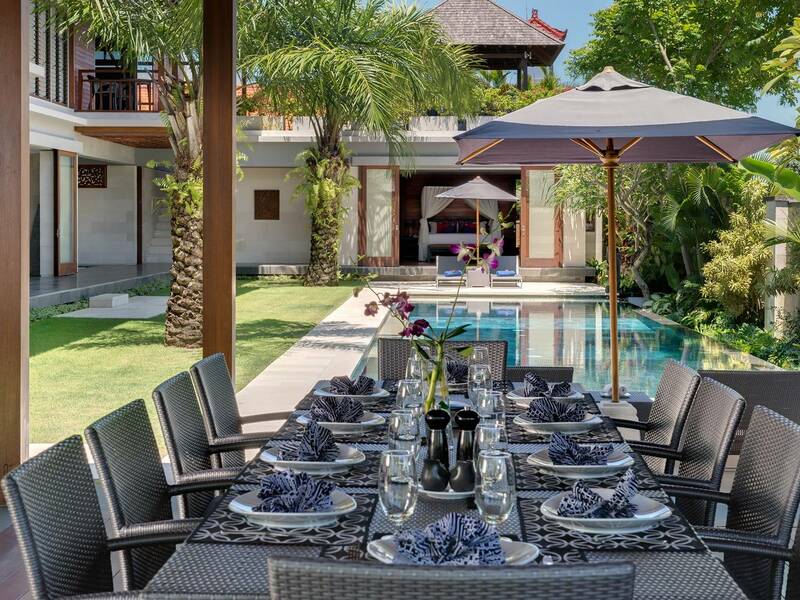 Surrounded by terraced rice fields, yet only a few minutes’ walk from the beach and an exciting and ever-expanding selection of places to eat and drink, this Luxury Canggu Villas lies on the outskirts of the small fishing village of Nelayan in the popular district of Canggu, south-west Bali. 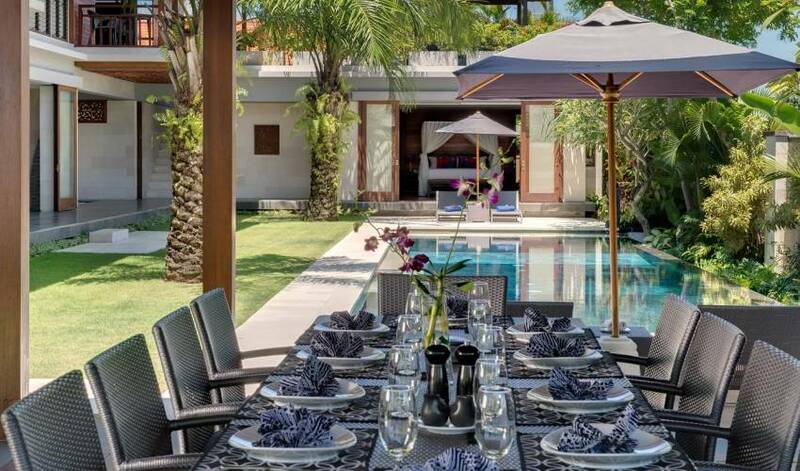 The villas are only a 20-minute drive from the restaurants and shops of cosmopolitan Seminyak, an hour from Bali’s cultural centre of Ubud, and 30 minutes from the island’s international airport.